At Barnhardt Manufacturing, we are committed to environmentally responsible manufacturing. We've proven this over time by holding all of our business lines to the highest environmental standards possible, and every one of them has wholly accepted this challenge. From cotton to foam, from farming to processing, and from certifications to recycling standards, we've continually met growing consumer demands, all while keeping a keen eye on the future. Cotton already has a lot going for it as a natural fiber; its annual renewability and homegrown supply chain provide huge eco-advantages. Now, modern farming innovations have only increased its environmentally friendly status, since energy usage, farming emissions, soil loss, and water usage have all decreased dramatically in recent years. Then, from the factory to the farm, our Totally Chlorine-Free (TCF) process ensures the most purified cotton, and doesn't release harmful toxins. Since the bleaching agent breaks down to hydrogen and water, there's also no chlorine in any wastewater discharge. While cotton's eco-friendliness is not a shock, many are often surprised to find out our foam innovations exceed environmental expectations, too. NCFI was the first North American polyurethane foam supplier to commercially offer hydrocarbon and HFC-formulated rigid spray systems as alternatives to hydrochlorofluorocarbons (HCFCs). Our Bio-Lux™Max5 is the first US flexible foam to receive the USDA Bio-Preferred Program’s coveted “Certified Biobased Products” label. The company was also awarded the EPA’s Stratospheric Ozone Protection Award (now known as the Montreal Protocol Award) as it continues to set new standards for the industry. NCFI is also completely compliant with ExxonMobil's safety procedures, which require the proper equipment, procedures, and training for customers before selling them any hydrocarbon-formulated spray systems. We have a handful of products that the USDA has found to meet or exceed the levels of renewable biobased ingredients. Biobased products are finished or intermediate materials composed in whole or in significant part of agricultural, forestry, or marine ingredients. Certain Barnhardt cotton products have received the Oeko-Tex® Standard 100 seal, which indicates the additional benefits of independently tested safety for skin-friendly clothing, as well as other textiles for end users. The test label provides an important decision-making tool for purchasing textiles. 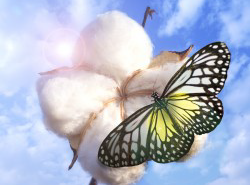 Barnhardt is the largest organic bleached cotton supplier and the only GOTS certified supplier in the USA. When using organically grown fiber our process can be adjusted to allow the fiber to qualify for the GOTS seal as a 100% organic product. The GOTS certification by Oregon-Tilth is an internationally recognized symbol of organic integrity, providing a system that combines strict production standards, on-site inspections, and legally binding contracts to protect the producers and buyers of organic products. We're proud to be a part of Cotton Leads™, a program for textile brands, retailers, and manufacturers committed to sourcing cotton that is grown in a responsible and transparent manner. Validating the Cotton LEADS™ program are the national-level oversight, regulatory enforcement, and transparency of practices common to both U.S. and Australia, the two member nations. Aside from the steps we take before and during our manufacturing processes, we also recycle industrial waste and by-products to the best of our ability. From Dalton Foam's use of recycled foam for carpet cushioning to Kinston Fibers' reclamation efforts, we always strive to find a way to maximize every scrap of foam or gin mote. In the past, many by-products fell by the wayside as waste, but today have found many practical uses.